It is now Saturday night July 4 and explosions are all around me. I have to admit I have never quite understood the desire for so many people to hear big bangs on their sidewalks. We have had our own big bangs. We are staying at Ganas on Staten Island, which is an intentional community that was started over 35 years ago. We have had many discussions already with members of the community about our philosophy of Villaging and will have many more I’m sure. We had known that there was at least one person here who was interested in talking about aquaponic farming so we set up a meeting with him for earlier today. He asked if he could bring someone and we said sure. He then announced in a community meeting that he was going to meet with us and that others were invited and later in the day we discovered a general invitation in the community newsletter about the meeting. As it turns out there were ten people there besides Laurie and myself. We were blown away by their interest and questions. In the meeting we showed some short video clips that we put together following our aquaponics internship in Hawaii and the discussion was fast and furious. 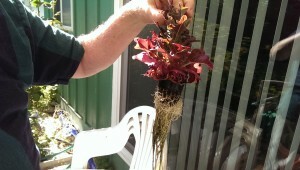 As a result I have been doing more research on the success of Aquaponic systems. Building a successful aquaponic food production system that makes money is not a slam dunk. There are many failures and some successes it seems. 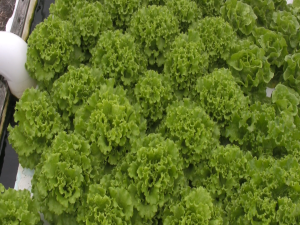 The research indicated that only 31% of commercial aquaponics farmers who responded to the survey reported that their operation was profitable in the previous 12 months. For more details visit: http://www.sciencedirect.com/science/article/pii/S0044848614004724. I was also surprised to learn that there have been several very large efforts to make aquaponic projects into big money makers. Some of these projects have been funded to the tune of 100s of thousands of dollars. I have not heard of any of these projects actually being successful. My belief is that with that kind of startup cost it would take a long time to generate much of a profit. I must say that I cringe when I read about these projects because I feel they miss the point and the possibility that aquaponic systems can bring. As noble as these may sound in the pitches they make for their funding, the underlying theme is that this large investment is really about making money. I think there is an integrity in aquaponics that is corrupted by the profit motive. Aquaponics is the balancing of living systems. We are dealing with life and nature here. Undeniably there is probably a lot of money to be made in this new industry, however when making money becomes the primary purpose of an aquaponic system, its life giving sustenance becomes corrupted and damaged. This is a food system. Its purpose is to give us life not profit. The factors that make aquaponic farms work and thrive depend on their care givers being connected to them and knowing how to put in the life corrections that balance the system. This is a skill of being able to perceive each individual project on its own within its own growing context. Dollar signs cloud this perception. Perhaps the success of the system depends as much on the heart and knowledge of the farmer as the mechanics of the system itself. The real step forward for food production is the Farm to Plate movement. When the pro fit motive becomes secondary, feeding people becomes primary,and food projects and aquaponic gardens become very appealing. Aquaponic systems make “Farm to Plate” possible any where: city lots and roof tops, small town plots, restaurants, personal homes, hospitals, town squares, shopping centers, etc. The Villaging Project | Powered by Mantra & WordPress.